See About release numbering to understand how you can figure out whether a specific cloud release is included in your version of Edge for Private Cloud. Warning: Caution: This release includes updates and bug fixes that may affect your API implementations. As always, we strive to introduce updates that are backwards compatible and don't break your code. However, it's possible that one or more updates may affect the behavior of your solution in places, including workarounds. Using the icon in this note, we've marked specific updates below that you may want to review to ensure your APIs behave as expected. The most important new feature in this release is the addition of support for Security Assertion Markup Language (SAML) 2.0 as the authentication mechanism for Edge, API BaaS, and the Developer Services portal. By using SAML with Edge, you can support SSO for the Edge UI and API in addition to any other services that you provide and that also support SAML. Note that SAML is only used for authentication. Authorization is still controlled by Edge user roles. See Supporting SAML on Edge for Private Cloud for more. The remainder of this topic contains details on all the new features, updates, and bug fixes contained in the release. The following features were deprecated or retired in this release. See the Edge deprecation policy for more information. The Apigee secure store, also known as "vaults," is being deprecated and will be retired in April of 2018. Vaults, which provide encrypted storage of key/value pairs, are created with the management API and accessed at runtime with functions in the apigee-access Node.js module. Following are the new features and enhancements in this release. In addition to the following enhancements, this release also contains multiple usability, performance, security, and stability enhancements. Edge now supports Security Assertion Markup Language (SAML) 2.0 as the authentication mechanism for Edge, API BaaS, and the Developer Services portal. SAML supports a single sign-on (SSO) environment. By using SAML, you can support SSO for Edge in addition to any other services that you provide and that also support SAML. See Supporting SAML on Edge for Private Cloud. After enabling SAML, you now use the new apigee-ssoadminapi.sh to perform many administrative tasks, such as creating users and organizations. A .tar based installation of the Developer Services portal uses Apache and MySQL or MariaDB. You can now migrate your existing installation of the portal to use Nginx and Postgres. This migration is required if you want to update to portal version 4.17.09. See Convert a tar-based portal to an RPM-based portal. You can now deploy Edge for the Private Cloud, API BaaS, and the Developer Services portal on Red Hat/CentOS version 7.4. See Supported software and supported versions. If "y", the installer check that the system meets the CPU and memory requirements for the component being installed. See Installation Requirements for requirements for each component. The default value is "n" to disable check. See Edge Configuration File Reference. With that property set to "y", the installer prompts you to select the IP address to use as part of the install. The default value is "n". See Configuring TLS/SSL for Edge On Premises. You are prompted for the system admin's password, and then for the new user password. For security reasons, the text of the passwords is not displayed as you enter them. See Configuring TLS for the management UI. You can use the conf_system_apigee.syslogger.dateFormat property on the Edge Message Processor to control that format. You must now use the SMTPMAILFROM parameter in the API BaaS installation configuration file. This parameter specifies the email address used when API BaaS sends automated emails, such as when a user requests to reset a password. See BaaS Configuration File Reference. You can now use the Router and Nginx web server for the portal to access ports below 1000 without having to run them as a different user. in previous releases, the Router and Nginx web server could not access ports below 1000 without running them as a special user. The properties used to configure the logging level for the Edge UI have changed. See Setting the log level for an Edge component for the new properties and procedure. Naming rules and validation have been updated for creating a custom consumer key and secret for a developer app. Consumer keys and secrets can contain letters, numbers, underscores, and hyphens. No other special characters are allowed. The Edge Router can now be deployed to a server that supports FIPS (Federal Information Processing Standards). Now ScriptableHttpClient reads the message context at start time. Previously, the Cassandra backup script stopped and then restarted the Cassandra server as part of the backup process. The script no longer performs this stop/restart and leaves the Cassandra server running during the backup process. in previous releases, the Postgres password was not set properly based on the value of PG_PWD in the config file. This means Edge for Private Cloud no longer restricts Node.js code from accessing certain IP addresses by default. See Understanding Edge support for Node.js modules for more. Resource names are now appearing correctly when creating proxy using OpenAPI. The /v1/servers/self/up API call now returns properly formatted xml or json instead of always returning text. Proxy and product names now work correctly when the name contains a space or hyphen. YAML files can now be edited using the API proxy editor. When you open a YAML file in the editor, an error message is no longer displayed. The Node.js Logs button will only display on the Trace page when the API proxy has Node source files. Fixed issue that was preventing the CSV file to be downloaded on the GeoMap analytics dashboard. 64122687 OpenAPI Specifications without operationIDs generates flows with names "undefined"
When generating an API proxy from an OpenAPI Specification that has no operationIDs defined, the path and verb are now used for the conditional flow name. Encrypted values in KVM not decrypted even when retrieved with private prefix. APIRT-3954 HTTP Health check should not execute more than once a second. This fix resolves an issue in which a large number of health checks impeded performance. The certificate chain warning indications have been removed from the UI. Alias rows which contain certificate chains will now display the data for the certificate closest to expiry in the "Expiration" and "Common Name" columns. The warning banner under the certificate selector of the alias panel has been changed into an informative annotation. In the Beta version of the new TLS keystores UI, when viewing the alias panel, the Actions buttons did not always work. This issue has been fixed. In the Beta version of the new TLS keystores UI, after updating an alias certificate, the alias panel would sometimes encounter an error and need to be refreshed in order to display the alias details. This issue has been fixed. When editing your user account settings, you are now directed to the two-factor authentication configuration page. For more information, see Enable two-factor authentication for your Apigee account. In order to update your password, you must sign out of your account and click Reset Password on the login page. Wildcard selectors were not working in the keystores list filtering input. This issue has been fixed. For CPS organizations, the keys field is not displayed on the developer details page. The cert validity icon now represents the currently selected cert, instead of always representing the head cert. API proxies will no longer be removed from the Proxy filter dropdown which has happened in the past in certain situations. If you select an API proxy that has no data for the selected time interval, No data to show is now displayed. The following usability improvements have been made to the transaction status API, described in View the status of transactions. If no start or end times are provided, the time range defaults to the current time plus or minus 5 seconds. If the utctime and utctime2 timestamps are equal, the time range will be the full second specified. If the utctime is greater than utctime2, the time values are swapped. If the timestamps are formatted incorrectly, a more informative message is returned describing the required format. In addition, an issue with the transaction status API has been fixed. 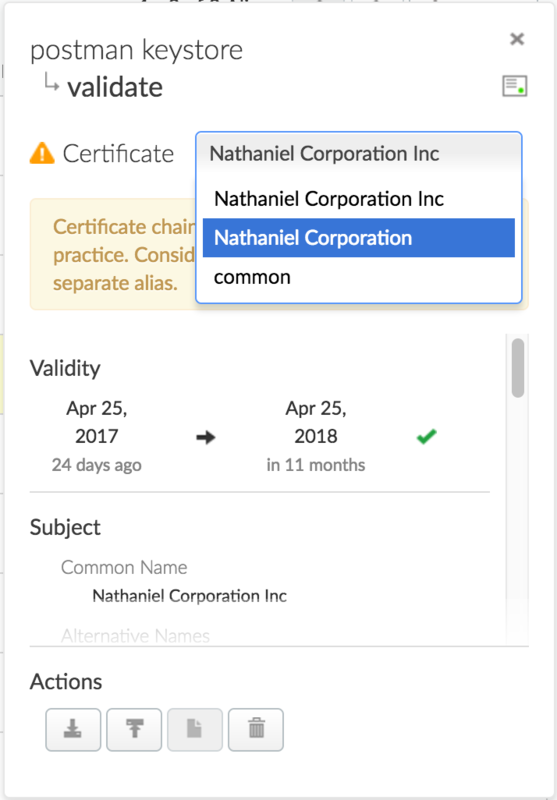 If you upload a certificate chain to an alias, when viewing the alias panel, you can now select each certificate from a dropdown to view its details. Note: Certificate chaining is not a recommended best practice. Apigee recommends that you store each certificate in a separate alias. When viewing developer details, CPS customers are now able to view the full list of developer apps. In previous releases, the maximum number of developer apps that could be viewed was 100. The Get debug session transaction data management API was throwing an HTTP 500 status code on errors. The API now throws a 404s instead. If you have scripts that are catching a 500 status code when getting transaction data, update those scripts to look for 404s. Updating entities (such as key aliases) with extended ASCII characters would fail due to an encoding issue. This issue has been fixed. HTTP 403 Forbidden errors are no longer categorized as Session Timeout errors. In the event the Edge UI timed out, an Unknown error message was displayed. A more descriptive timeout error is now displayed. MGMT-3977 A security fix was made related to user permissions. An object that was cached by a previous release may not be recovered from the cache correctly.